On October 15, a United Launch Alliance (ULA) Atlas V rocket carrying a payload for the National Reconnaissance Office lifted off from Space Launch Complex-41 at Cape Canaveral Air Force Station in Florida at 3:28 a.m. EDT. This mission was launched aboard an Atlas V Evolved Expendable Launch Vehicle (EELV) 421 configuration vehicle, which includes a 4-meter payload fairing (PLF) and two solid rocket boosters. The Atlas booster for this mission was powered by the RD AMROSS RD-180 engine and the Centaur upper stage was powered by the Aerojet Rocketdyne RL10C-1 engine. 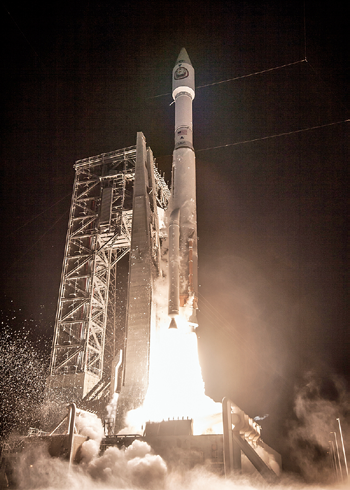 This was ULA’s seventh launch in 2017 and the 122nd successful launch since the company was formed in December 2006. United Launch Alliance Atlas V launch of the NROL-52 satellite. Photo is courtesy of ULA. The EELV program was established by the USAF to provide assured access to space for Department of Defense and other government payloads. "Never before has innovation been more important for keeping us ahead of the game. As the eagle soars, so will the advanced capabilities this payload provides to our national security,” said Colonel Matthew Skeen, USAF, Director, NRO Office of Space Launch. 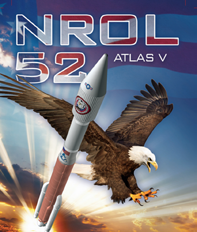 NROL-52is the fourth of five launches slated for the NRO in 2017. The next NRO launch is on schedule for December from Vandenberg Air Force Base, California. With more than a century of combined heritage, United Launch Alliance is the nation’s most experienced and reliable launch service provider. ULA has successfully delivered more than 120 satellites to orbit that aid meteorologists in tracking severe weather, unlock the mysteries of the solar system, provide critical capabilities for troops in the field and enable personal device-based GPS navigation. Kratos’ satellite communication business supports more than 85 percent of U.S. space missions and is used by more than 75 percent of the world’s commercial satellite operators, with products and services ranging from command and control (C2) to signal processing, RF interference mitigation, network operations and cybersecurity. Kratos satellite products include EPOCH® IPS, the industry’s leading satellite fleet management system; Monics®, the leading carrier management product; Compass® for managing satellite networks; and NeuralStar® for terrestrial network operations and Service Quality Management (SQM). Additionally, through its Kratos RT Logic subsidiary, the Company delivers advanced products and capabilities for space-to-ground communications, assured data transport, applied test and training and cyber/mission assurance. Kratos, through its satellite business, operates the only global network of RF monitoring and interference detection sensors, providing commercial and government clients with important situational awareness data and analytics. A Soyuz-2 launch vehicle with a Meridian satellite payload. Photo is courtesy of TASS. GPS OCX + LCS Delivered To U.S.A.F. The USAF's Space and Missile Systems Center has announced that the United States Air Force has accepted delivery of the Global Positioning System Next Generation Operational Control System (GPS OCX) Launch and Checkout System (LCS) baseline from Raytheon Intelligence and Information Systems. Also known as Block 0, LCS demonstrated conformance through test and analysis with all contractual requirements. OCX has had numerous challenges delaying the delivery of this critical capability. This delivery marks a significant program milestone providing the Air Force with a cyber-hardened ground system to support the launch and on-orbit checkout of the GPS III satellites. OCX Block 0 is the foundation for Raytheon’s future Block 1 and 2 delivery, slated for delivery in 2022. Today mission operators are utilizing LCS as part of the GPS III Mission Readiness Campaign. The ground system is performing as expected during the rehearsals and space vehicle checkout, giving the Air Force confidence in its readiness to support launch and on-orbit operations. The first launch of a GPS III satellite is scheduled for 2018. Air Force Space Command's Space and Missile Systems Center, located at Los Angeles Air Force Base in El Segundo, California, is the U.S. Air Force's center of acquisition excellence for acquiring and developing military space systems. SMC's portfolio includes the Global Positioning System, military satellite communications, defense meteorological satellites, space launch and range systems, satellite control networks, space based infrared systems and space situational awareness capabilities. Advantech Wireless has presented the details of their Second Generation Advanced GaN based SSPAs/BUCs and WaveSwitch™ “on-the-fly” SATCOM Waveform Switching Technology during the recent AfricaCom and Global MilSatcom 2017. This unique technology enables a wide variety of commercial and military applications, from Ultra HD TV transmission, SATCOM-on-the-Move (SOTM), internet access for aircraft passengers, and SATCOM manpack terminals. The new generation of GaN based SSPAs provide higher performance and reliability, combined with the smallest form factor and lowest power consumption on the market. 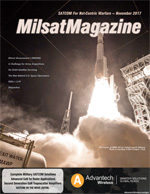 To address the high complexity of new generation multiservice IP broadband satellite deployments, Advantech Wireless introduced WaveSwitch™, the company's multi-service modeling architecture that optimizes waveform assignment to achieve the highest application performance, with minimum satellite bandwidth resources and the highest network utilization. 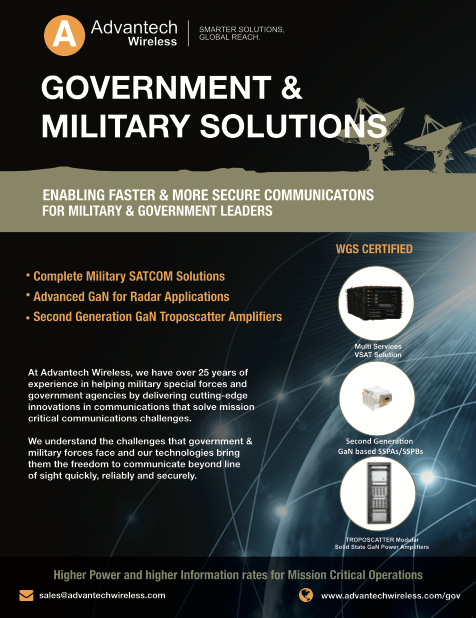 At SMi's Global MilSatCom 2017 in London, Advantech Wireless presented details of their new line of GaN based Solid State Power Amplifiers for Advanced Defence Communications along with the firm's Military Grade VSAT Hubs with unique WaveSwitch™ Technology for their ASAT II Multiservice VSAT System. 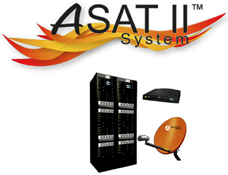 Cristi Damian, Vice President Global Sales and Business Development, RF and Microwave Products at Advantech Wireless, noted that as the Satellite Market is evolving, so does SATCOM technology. He added that applications that could not be addressed in the past, are now possible, with the correct combination of network planning and hardware selection. Cost can be drastically reduced, by adopting advanced technology. ELTA's ELK-1882T SATCOM network system will be installed for the first time on tens of very advanced Western fighters, with first deliveries planned for 2021. This network system is the latest technology developed by ELTA Systems Ltd., a group and subsidiary of IAI (IAI/ELTA). IAI/ELTA's SATCOM solutions was on display at SMi's MilSatCom Show in London. The customer has selected the innovative ELK-1882T Ku-band phased array SATCOM network for the product's ease of installation and integration, which boasts minimal impact on aircraft performance due to the conformal installation. This conformal flush installation generates negligible drag, as opposed to conventional high profile SATCOM dish antennas. In addition, the new system has no moving parts, which greatly enhances reliability and robustness, especially on board modern high maneuvering fighters. The onboard system (terminal) includes a conformal phased antenna installed on the jet's fuselage, comprising the transceiver, modem and High Power Amplifier (HPA) in a single LRU, with an IP LAN connection to the aircraft avionics. Nissim Hadas, IAI Executive VP and ELTA President, noted that this significant achievement is the first milestone in positioning ELTA as a leader in electronic steering technology for aircraft communication solutions.